So, the bottom line is: ask your employees to add your target keywords to their profiles and see your company go up in the search results list. 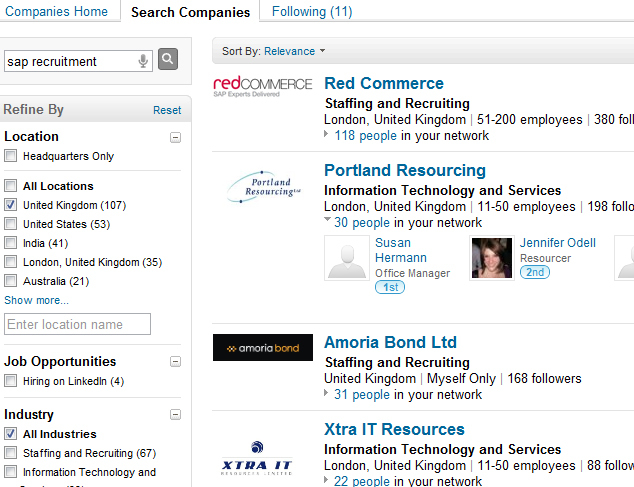 As an example, below you see a screenshot listing UK companies that are found in the “SAP recruitment” search. If you belong to one of these companies, you can now try to get higher up in the list using the hint. Keep in mind that LinkedIn doesn’t recognize variations of a word, so, say, sourcer, sourcers,and sourcing would be separate words to optimize for. It did work in my experiments. 🙂 Try a single keyword first.